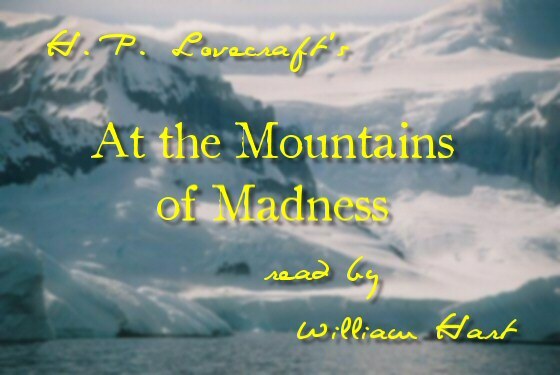 ← H. P. Lovecraft’s, “At the Mountains of Madness” Chapter 07 Read By William Hart Is Now On YouTube! Eight chapters (roughly 73%) down, with four more (roughly 27%) to go, one-at-a-time, until we reach The End. Chapter Nine is coming soon, but I can’t predict the date. Hang on for more! I just wish I had a sound-proofed studio; or far more control over the dogs, cats, people, cars, trucks, airplanes, helicopters, horns, music, auto-repair, telephone, radio, alarms, plumbing, television, coughing, and stomach noises than I do. That way I could make one smooth recording of each chapter, rather than multiple takes which have to have every bit of the background manually cleaned up; and that means hours of recording for each chapter, and more hours for editing. Oh well. I’m getting them out as fast as I can! This entry was posted in 1920's, 1930's, 3D, At the Mountains of Madness, Audio, Audio Book, Audiobook, Book, Books, Elder Ones, Fiction, Free, H. P. Lovecraft, H. P. Lovecraft Updates, James Cameron, MP3 Files, Mythos, Necronomicon, Old Ones, Readings, Shoggoths, Universal Studios, William (Will) Hart and tagged 1920's, 1930's, 3D, At The Mountains of Madness, Audio Book, Audiobook, Book, Books, Cameron, del Toro, Elder Ones, Fiction, Free, Guillermo, Guillermo del Toro, H. P. Lovecraft, Hart, James, James Cameron, Lovecraft, MP3, Mythos, Necronomicon, Old Ones, Readings, Shoggoths, Studios, Universal, William, William Hart. Bookmark the permalink. Keep up the good work, W.H. I remember from my own podcasting how much I hated post-production. And yes, post-production is a necessary pain; but the end results are what count! I’m just trying to give back what I can to the entire Lovecraft community; one comma at a time!